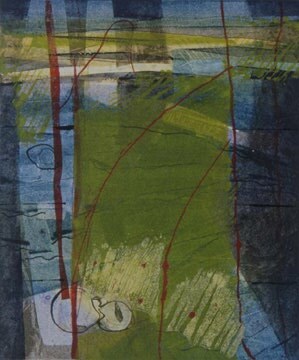 To create a monotype, the artist manipulates ink or paint onto the surface of a smooth plate and then transfers that image onto paper by means of pressure. The pigments may be applied by means of rollers, brushes, stencils or inked collage materials. The plate may be made of anything that can withstand pressure such as plexiglass, metal, cardboard or occasionally wood. Pressure for transferring the pigments from the plate to the paper may be done by simply hand- rubbing or using an etching press. Since no image has been incised or otherwise permanently fixed to the plate as in other print media, the image cannot be repeated exactly and only one (mono) print can be made. A small number ( 1 -10, depending on the nature of pigment application) of subsequent "ghost" prints may be pulled from the same plate but they will be successively paler and different in character. 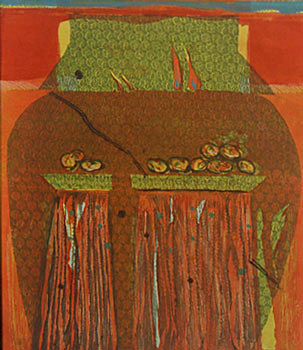 Frequently, an artist may rework a completed monotype with the addition of collage materials, pastels, inks or other drawing materials. 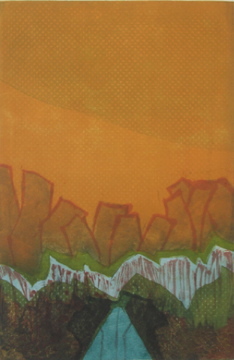 Monotypes may be made on paper or fabric. The medium is a preferred medium for artist, Carol Odell, because of its painterly qualities. The freedom of maniuplation and the luminous quality of the prints allow her to concentrate freely on the harmonious expression of color and form. 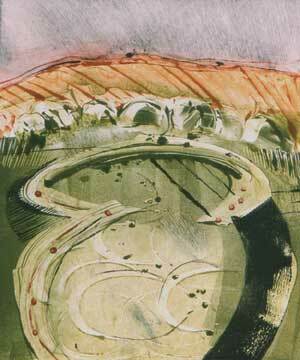 She uses plexiglass plates and oil paints and employs an etching press for printing. 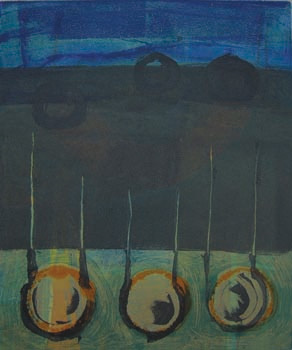 Often she uses a technique of "overprinting" whereby two prepared plates are printed on the same paper. The papers she uses are 100% rag papers or Japanese handmade papers. Although the results of monotyping can often be serendipitous, the artist with experience comes to know how certain materials and methods will react to varying pressures and learns to anticipate and therefore control the results of the final product.